Took my girl upstate on Sunday for some apple picking (rented a Civic - thrilling) and some folks were having a good ol' yard sale right next to the orchard. 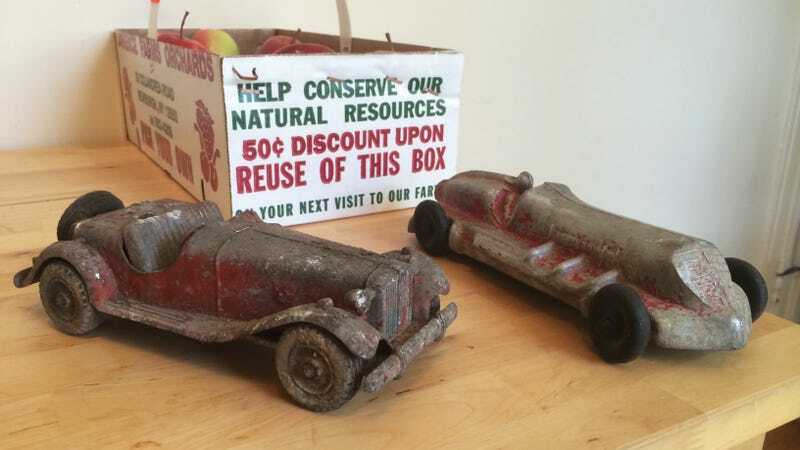 Grabbed these two old metal toy cars for $12, and some casual research shows that was likely a bargain. First up is a roadster, possibly an MG, by Hubley Manufacturing. Since it's stamped with "Hubley Kiddie Toys" it's probably from the early '60s. Missing the windshield unfortunately, but the spare tire is still there! A few auction sites have ones in kind of crappy condition going for at least $30, with nicer examples pushing $100. This one was trickier, since the stamp on the underside is pretty worn and it's not an identifiable model, but I finally figured out that this is an generic aluminum "race car" by E.R. Roach Industries, likely from the late '40s or early '50s. The paint is almost gone and it's missing the spare tire on the back, but even ones in this condition are going for above $50 online. I don't plan on selling either, though - time for some small-scale resorations! Any tips?